Please note that the Clore Learning Centre will be closed to the public on 9 April 2019 between 11.00-15.00 whilst our autism frindly session Creative Studio is running in the Clore Studio. It will re-open to the publc at 15.00 on 9 April. Welcome to the Clore Learning Centre, developed in response to our current display on the second floor, Op Art in Focus. Have fun in our free, family space. Design colourful patterns on the magnetic board, play in the zig-zag dens and arrange objects on our pegboard into bright and interesting patterns! 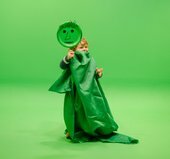 Step into our green screen and create your own art-inspired environment. Take a picture of yourself inside this dream-like world and share with the hashtag #TateDreamScreen. Level 1, through the exhibition space. Find out how to create your own green screen at home!